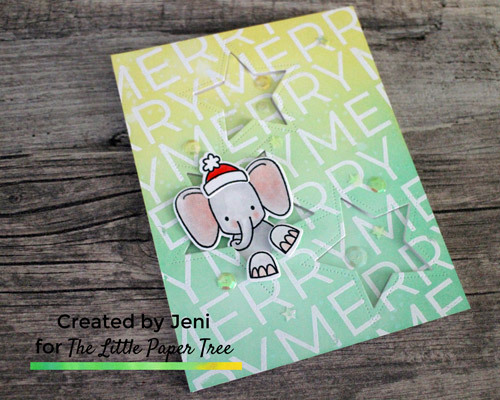 Hi, it’s Jeni with a cute Christmas card and video tutorial today. Head to the YouTube channel to see the video on how I made this card or stay here and read the tutorial for this card and the other cards in the video tutorial. All the products I used will be listed in the supply list and linked to the shop. When I first saw the Polar Peek A Boo Pals stamp set with the santa hat I wanted to make a card with the elephant from Peek A Boo Pals stamp set. I started this card by embossing the word “Merry” across the background at an angle. An angle helps disguise any wonky stamping. I prepped my card with an anti static powder tool and stamped in Versamark ink. I stamped half the card, then covered with white embossing powder and stamped the rest of the card. This way I could heat emboss when the whole background was done and could easily see where I had already stamped. I diecut the Three Stars die and used purple tape to hold them in place while I did some ink blending with Distress Oxides. I used Squeezed Lemonade and Cracked Pistachio. I held the card panel to a card base and adhered the diecut stars into the gaps then added foam tape to the back of my embossed panel. I adhered this to the card then stamped and coloured the elephant, elephant hooves and santa hat. The colours I used are listed with the supplies below. I used a piece of foam tape for the elephant and tucked his body under the edge of the star. I foam mounted the hooves and hat on the embossed panel so they have double dimension height. I finished by adding some sequins with a drop of Nuvo Crystal drops into the center. On the video there are photographs of two other cards that were inspired by this card. Click HERE to watch the video on YouTube. The background is slightly different for this card. I stamped a small “Merry Christmas” between each big “Merry” and heat embossed in white. The Distress Oxide colours I used are Milled Lavender and Seedless Preserves. I had to use the cute bear with his scarf and hat in the bottom star. I added some vellum behind the stars and created a shaker pocket for each star, with vellum on the other side too. There is no foam tape between the vellum layers so they sequins won’t move much but the sparkle will still show. I added this to a A2 sized card base. For the green card I stamped the same as on the purple card alternating ‘merry christmas’ with ‘merry’ and diecut the Three Stars. I used Cracked Pistachio, Iced Spruce and Lucky Clover Distress Oxide ink for the ink blending. I added the elephant with a santa hat in the top star. The reindeer with a scarf in the middle (isn’t he so cute with the lights tangled in his antlers??) and the penguin with a hat in the bottom star. The green panel is raised up with foam tape, as are the animals feet/hooves/flippers. Which is your favourite? I hope you are inspired to create some fun critters Christmas cards and enjoyed the video tutorial. Don’t forget to join our Tribe at Facebook to share your cards with us.